ACCESS AND PARKING: Open daily dawn to dusk. Please stay on delineated trails. No parking on Lakeview Terrace. On-street parking available on Summer Street and Ridge Road; then cross main street to Preserve entrance. Use care crossing busy street. Motor coaches can park on Lakeview Terrance with permission from Emerson Police Department or at fisherman's parking lot with permission from United Water New Jersey (201-767-9300) www.unitedwater.com/uwnj. NEAREST PUBLIC TRANSPORTATION: New Jersey Transit Bus Line No. 165 Westwood/New York or NJT Pascack Valley rail lin stops at Emerson Station at Linwood Avenue and Kinderkamack Road. Walk east on Linwood Avenue and follow this to Main Street. Continue walking on Main Street to Lakeview Terrace. SPECIAL FEATURES: An excellent self-guided nature trail begins at either entrance and proceeds to 18 points along the trail. A CLOSER LOOK: Be sure to look at the water-loving equisetum, or horsetails, which was used by the early settlers for scrubbing pots and pans because of its rough surface. SITE DESCRIPTION: This 19-acre tract of forest is an excellent example of the habitat that once covered much of Bergen County. Prior to the site being purchased by the Borough of Emerson, it was in danger of being clear-cut and developed. Thanks to the people of Emerson; Bergen County Trust Fund; and the Meadowlands Conservation Trust, holder of a conservation easement on the site; it has been preserved forever. The Preserve is adjacent to hundreds of acres of additional protected land as well as an access gate to the Oradell Reservoir. DON'T MISS: Don't miss the Preserve's two vernal ponds, which host breeding frogs, toads and salamanders as well as fairy shrimp. Late winter and spring are the best times to observe and study the unique wildlife found there. Winter: Finches and other over-wintering bird species like Northern Cardinal, Black-capped Chickadee, Dark-eyed Junco, White-throated Sparrow, Tufted Titmouse and White-breasted Nuthatch can be found. Peer through the fence for a great view of the Oradell Reservoir and roosting waterfowl such as Common Merganser, Ruddy Duck, Common Goldeneye and Bufflehead. Spring: The site attracts migrants like Chestnut-sided, Black-and-white, Blackpoll, Yellow-rumped, Northern Parula and Common Yellowthroat Warblers, Blue-headed and Red-eyed Vireos along with Wood, Swainson's and Hermit Thrushes. When migrant songbirds return, they stake out their breeding territory by singing. This "dawn chorus" is best in May. On-site wetlands and vernal ponds are usually filled with spring peepers in early spring. Summer: This is the slowest season for viewing wildlife but a good time to look for wildflowers and butterflies and enjoy the large concentration of New York fern that line much of the trails. Resident woodpeckers such as Downy, Red-bellied and Common Flicker are evident as well as Northern Mockingbird and Blue Jay which can be seen perched along the field edges. Bring insect repellent and watch out for poison ivy. 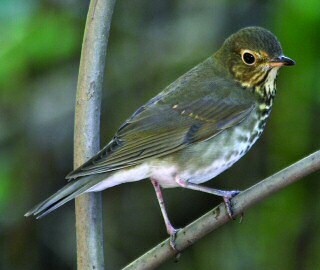 Fall: A good time to look for migrating passerines moving southward. Sharp-shinned and Cooper's Hawks often follow them. Look for Wild Turkey feeding on acorns, walnuts and beechnuts.